Im Titzu holds demonstration against Nakba Day events in universities, hands out the sweets Marwan Barghouti cheated on hunger strike with. 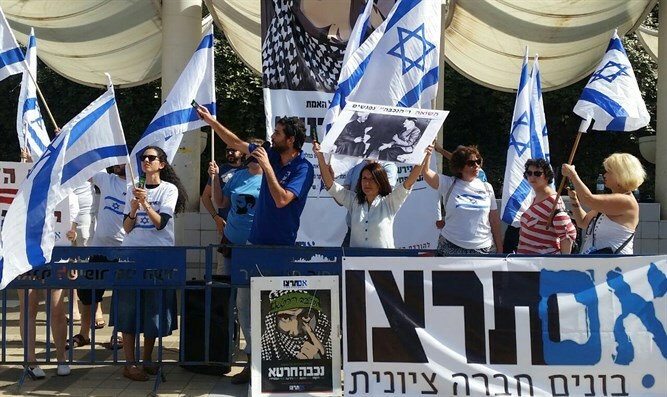 Dozens of Im Tirtzu activists and other Zionist activists held the annual Nakba Day event which took place today at Entin Square at Tel Aviv University. The event is meant to remind leftist and Arab students how good it is to live in Israel rather than elsewhere in the Middle East. The Im Tirtzu activists waved Israeli flags and handed out booklets which were meant to debunk the lies of the anti-Israel narrative. This year, a huge sign was raised which called the Arab Nakba (Arabic for catastrophe) a lie. The activists also distributed dozens of 'torteet' chocolate sweets, the same sweet convicted murderer Marwan Barghouti, the leader of the hunger strike among security prisoners in Israeli prisons. was caught eating. The film of Barghouti eating the sweets showed that he was cheating on the hunger strike. Matan Peleg, director general of the Im Tirtzu movement, said at the event: "It is absurd to see what higher education institutions, which are funded by the Israeli taxpayer, do with that public funding they receive. The university must be kept from becoming a harsh hotbed of anti-Zionism." "The universities should not sponsor and finance events that accuse the State of Israel of ethnic cleansing and incite against IDF soldiers," he added. "Those who want to promote the Palestinian lie in Israel should do it in a private institution. [When there is] a phenomenon in which 'the state finances the oppressors,' it is a failure of values and an illogical [situation]."